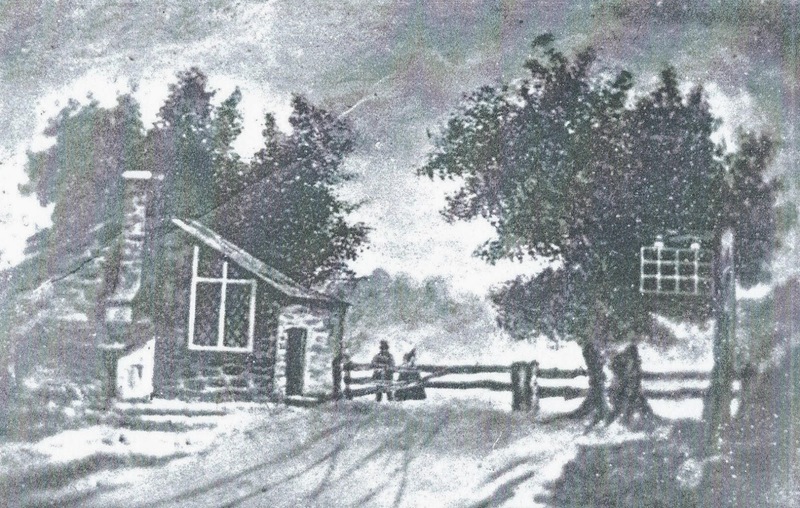 Forest Gate Industrial School was located on site of Woodgrange manor, which was purchased in 1847 by Samuel Gurney , Quaker banker and brother of Elizabeth Fry. 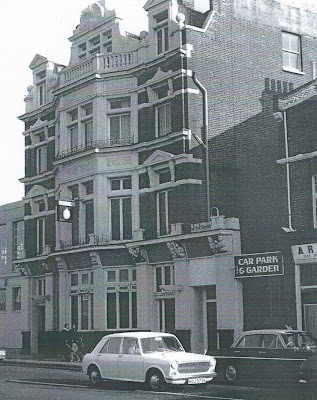 It was located in buildings that largely survive today on Forest Lane, opposite the Forest Gate - Stratford railway line. 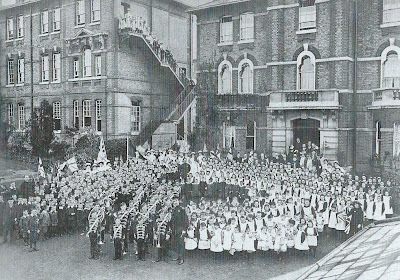 In 1852 Gurney gave the land to Whitechapel Board of Guardians who built the Forest Gate School for poor children there in 1854. It was residential, and essentially an outpost of the Whitechapel workhouse, away from the choked inner district from which the children sprang. 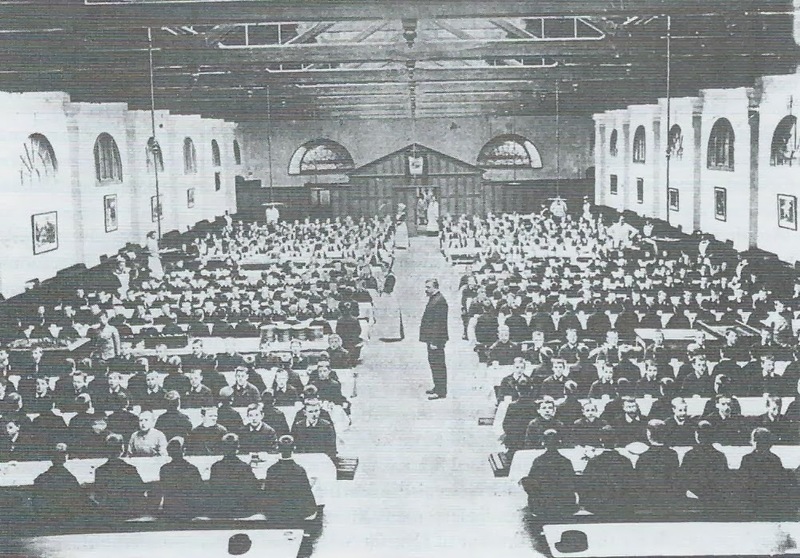 The Institution was transferred in March, 1869, to the Board of Management of the Forest Gate School District, which comprises Hackney, Poplar and Whitechapel Unions; and remained as a residential unit for children of the workhouse poor. It was the scene of a tragedy in 1890, which caused the deaths of 26 children (this will be covered in the future, on this site). It remained a school until 1906, and was for a short period (1908 - 1911) the site of the Poplar Workhouse, itself. 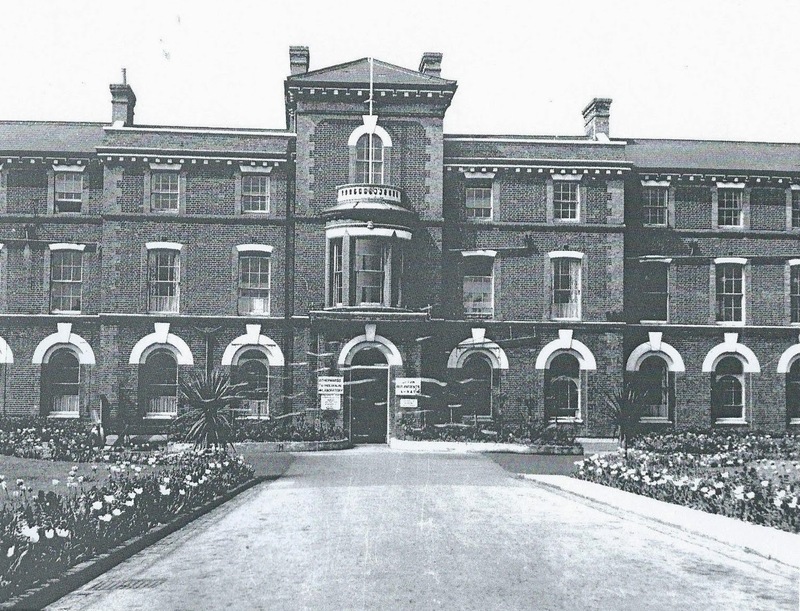 The site subsequently became the location of Forest Gate Sick Home (1913 - 1930), and more recently a maternity hospital (1930 - 1986). It suffered serious bomb damage in 1940. After the hospital was closed, the buildings were turned into flats and their grounds were turned into Forest Lane Park in 1994. Several of the original Industrial school buildings survive. Inspired by Dickens, and popular late nineteenth century poems and tales of Christmas day in the workhouse, the short-lived Forest Gate Weekly News paid the institution a series of visits over the Christmas period 1896. We reproduce, below, their slightly wordy account of what they saw. It provides a fascinating insight of life for many of Forest Gate's poor children, 117 years ago. Meanwhile, Happy Christmas to you all, in 2013! Most Forest Gate residents are familiar with the large building in Forest Lane. But probably few of such residents are aware of the extent of the complementary buildings which stand to the west and rear of the main block, or of the "world within a world" which is living out its life and acting out its daily scenes on some part or other of those thirteen acres which the great rectangular site covers. The place is altogether too vast to be grasped or understood at a visit. I have made three separate visits during the past week or so and have finally come away pretty fully informed and greatly interested. My first visit was made prior to Christmas, when Mr. Duncan (who has been Superintendent for eighteen years and an official of the Institution for thirty) received me very pleasantly; explained what was projected in the way of Christmas festivity; and gave me a few peeps at the different departments. I saw the scores of plum puddings coming out of the coppers in the great kitchen; I saw boys, fresh from the tailors' or bootmakers' shops having their evening spray bath in the large lavatory; and I ascended stairs and looked with strange interest into the bedroom which was the scene of the deplorably fatal fire of several years ago. The roast beef stage was over and the plum pudding stage had begun. 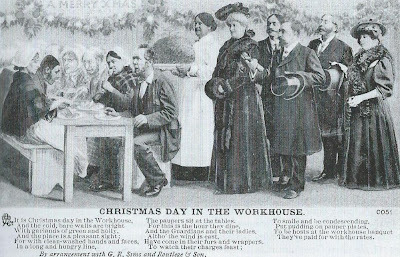 Long strings of the youngsters, indeed, were coming up to the serving tables for "another plateful, please", and presently it was evident that, as with the Cratchits - the poor family of an under-paid clerk in Charles Dickens 'A Christmas Carol' - so with these, "everybody had had enough". At last a gong sounded, and this produced another spectacle that was pleasant to look upon. Every child rose - from the lad of fourteen, ready for the bigger world outside, to the mites of four or five with, probably, many more years of workhouse life ahead of them. The gong sounded again, and now five hundred pairs of hands were reverently folded. A third time the gong sounded; the notes of a harmonium were also heard; and grace was strongly and clearly chanted by all the children, many of whom closed their eyes and moved their heads as if greatly enjoying. The only manager present at this Christmas dinner was Mr. W. Crooks, L.C.C., with whom I had a chat and who seemed to take an intense, and yet keenly practical, interest in the proceedings. Asked by Mr. Duncan to say a few words he responded to the invitation in robust and incisive style. He wished the youngsters every enjoyment; said he was sure the big girls would look after the little ones; and expressed the half-dubious hope that the big boys would be equally thoughtful. Next came the distribution of fruit and nuts. At the end of each table was a clothes-basket piled high with paper bags, each containing two oranges and a double handful of crack-nuts and chestnuts. 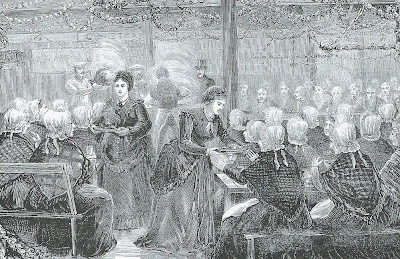 As the children files away from the tables, each was enriched with its modicum of dessert, and to see the tiny ones, especially, hugging those bags against their pinafores as they passed out was to understand quite clearly how much difference every one-pennyworth of fruit administered once in twelve months may make, in a pauper child's life. But there was still rarer joy beyond. For had not the editor of "Truth" sent full five hundred toys - although not, as one little girl lamented, one single doll amongst them - and were not new sixpences, from the same bountiful source, to presently become as plentiful almost, as blackberries in September. My third and principal visit was made on Tuesday morning last. A dense fog everywhere prevailed and I was glad that I had seen the place under the more cheerful weather conditions of Christmas Day. Mr. Duncan again kindly pioneered me through, and I cannot speak too highly of the courteous attention paid to me by this gentleman. I recognised from the first that it was not, strictly speaking, a local institution that I was visiting, but if it had been one maintained strictly by and for Forest Gate inhabitants I could not have been accorded a better reception. There may be readers who would like to know exactly what purpose the Forest Gate District Schools serve, by whom and when they were erected, and by whom they are maintained. In a sense their history is to be found cut in marble on the walls of the large entrance hall. Over the fireplace is a sculptured tablet which states that "this Industrial School was erected in 1854 by the Guardians of the Poor of the Whitechapel Union". But it is an Industrial School no longer; for on an opposite tablet one reads: "This Institution was transferred in March, 1869, to the Board of Management of the Forest Gate School District, which comprises Hackney, Poplar and Whitechapel Unions." Below are set forth the names of the first managers and officers - nineteen in all - and Mr. Duncan, as he stands beside me says: "That tablet is really a gravestone. Of the nineteen whose names are on it only three are now living. Such are the changes that less than thirty years brings about." I note that of the managers of 1869 the two survivors are Mr. E.N. Buxton and Sir (then Mr.) Edmund Hay Currie. 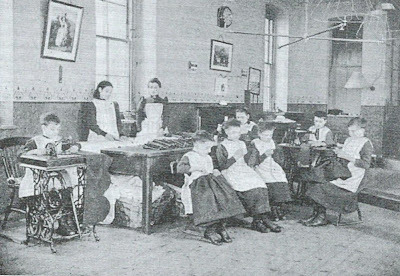 They are simply workhouse schools carried on, for reasons of convenience, away from the workhouse. A man tires of the battle of life and goes into the Poplar or the Whitechapel Workhouse, taking his children with him. The latter are sent to Forest Gate. The man tires of workhouse routine and desires to try the battle of life once more. His children are sent to meet him and from the workhouse gates they emerge together. Out by way of the front doors and away in the fog towards the detached building lying eastwards in the grounds. This is the Infirmary and it has about forty occupants, very few of whom, however, are in bed. When anything is the matter with a child, from a cut or bruise upwards, it is sent off to the infirmary forthwith, and seen by the doctor (Mr. Bell, of Leytonstone) at his next daily round. The Infirmary is divided into boys' and girls' sides and has its night and day wards like the bigger Institutions of the kind elsewhere for bigger people. There are a few little chaps in bed and they all seem glad of a cheery word from Mr. Duncan. They appear to expect this as he walks around and they are not disappointed. In the playrooms, too, where all the "Truth" toys are still in evidence, the little folk are left all the more cheerful for the visit. To the rear of the Infirmary - and also - detached - is the Infant School building, which possesses almost as imposing an elevation as that of the main structure seen from Forest Lane. All the rooms, corridors, and staircases here, as elsewhere, are delightfully clean and fresh. It is true that, a few months back (during a fortnight's absence of the entire colony of boys and girls under the Country Holidays Fund scheme) a wholesale renovation of walls, ceilings, and so forth took place, but spotless cleanliness is the absolute rule of the place and no deviation therefrom is, under any circumstances, permitted. As Mr. Duncan passes round he occasionally stoops and draws his finger across some portion of the polished flooring but fails to bring away with it any trace of dust. His daily pilgrimage through all rooms is a matter of some hours and the irregularity that escapes his eye must be of microscopical dimensions. An interesting portion of the Infant Department is the Kindergarten School. In the centre a may-pole stands, from which long coloured streamers hang, and the plaiting of these in the dance is an occasional popular interlude with the young scholars. There are well-furnished dolls' houses and numerous cases and cupboards, the contents of which indicate that many clever little fingers have been at work. 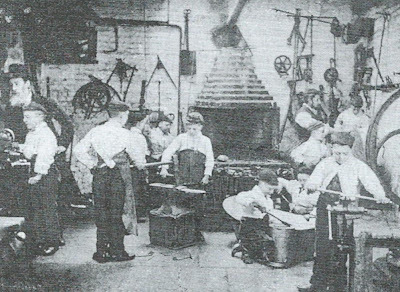 More substantial trophies of juvenile skill are the dolls' houses themselves and some of the forms and desks, the handiwork of boys in the carpenters' shop. We visit this place presently and see some good specimens of joining and cabinet making. 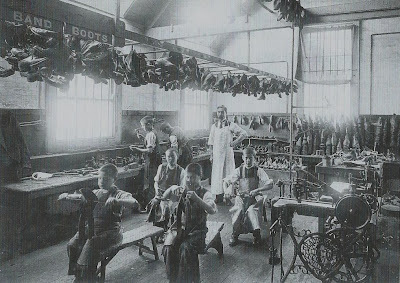 Near at hand are the bootmakers' and tailors' shops where all the repairing for the Institution is done by the boys. Here, however, a point comes in, which Mr. Duncan raises and which I feel bound to emphasise. Children must pass the Fourth Standard in the school before being put to any kind of work. The consequence is that the vast proportion passes out into the world utterly untrained in any sort of handicraft. Education is undoubtedly a good thing, but wage-earning power is surely better. Other interesting departments are the wardrobe rooms, where everything is carefully sorted, numbered and "receptacled" - "a place for every child's clothes and every child's clothes in their place" seeming to be the motto that here prevails; and the laundries where machinery and deft handling combine to produce that pleasing effect of snowy whiteness which table and bed linen throughout the Institution display wherever encountered. A smooth-running steam engine works the laundry machinery and in the engine room the mechanic who keeps things generally in order has his work bench and pursues his useful labours. At the northernmost boundary of the grounds are the playing fields and there are also asphalted playgrounds both covered and open. The boys - in humble imitation of those of the Charterhouse - do not wear caps out of doors and are healthy and hardy in spite of - and, perhaps, by reason of - the exposure. Mr. Duncan has almost a passion in this direction, and he has hit upon an extremely clever device for furthering his ideal. 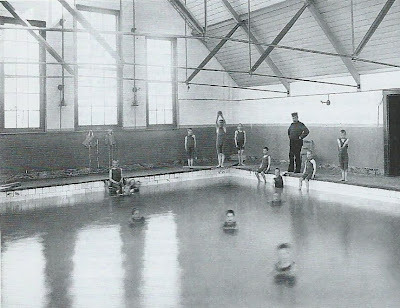 Finding that it is utterly futile to expect a number of children using ordinary lavatory basins to empty the water after each ablution he has caused rose-nozzles to be fixed at the bottom of each basin, the result of which is a constantly-fresh supply of water in the form of fine spray in which the hands and face can be washed under the most pleasant and effectual conditions. It is sometimes alleged of the lower section of the poor that they have a natural antipathy to water and its resultant cleanliness. If this be true it is gratifying to know that from the Forest Gate District Schools there is constantly issuing a wholesome leaven which may presently work a desirable and beneficial change in matters ablutionary. I asked a question of Mr. Duncan which, he says, almost every visitor asks. It was whether the massing of children together does not lead to hurtful moral results. His reply was interesting and instructive. "In all my experience here the matter has not once arisen. I believe these children to be perfectly innocent and that there is even less likelihood of mutual contamination than in a large public school where children of the better classes congregate. Once or twice a new boy has been caught writing objectionable words upon a wall and he has been brought to me by the other boys. I have said: 'What shall I do to him?' and they have said: 'Flog him, sir.' I have replied: 'No, I will leave him to you, only don't hit him.' "
"But," added Mr. Duncan with a twinkle, "I don't think that boy has been caught writing on walls again." Street names in Forest Gate record a wealth of English history: literary figures, politicians and many others. Some roads bear the names of royal residencies or great houses. Still others record place names across the UK. A few recall more ancient local topographical features. We are heavily indebted to Newham Story for the information in this feature. Although this website is still live, it is no longer actively administered, due to Newham Council cuts. The list of streets, below, is not definitive and some of the explanations seem a bit light and possibly implausible. As ever, on this site, we would welcome all additions, amendments, suggestions or alternative explanations, via the comments box, below, or an e.mail. 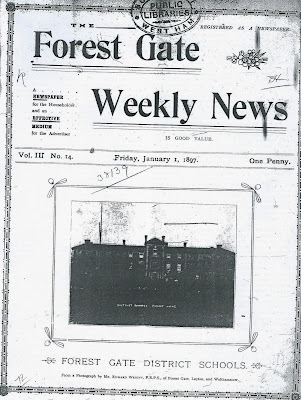 Forest Gate itself derives its name from a gate leading into Epping Forest, erected to prevent cattle straying from the Forest into the High Road. It was located close to the former Eagle and Child public house. 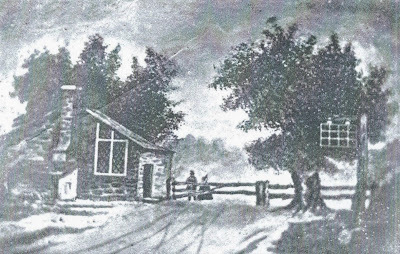 It never was a toll gate, and was demolished along with the keepers' cottage, in 1881. (A 'forest' is a royal hunting reserve, it will, of course, contain trees; any standing timber should more properly be referred to as a 'wood' or 'woodland'). This list is not exhaustive but it does give an indication of the breadth of street-naming as housing estates were developed in the 19th and early 20th century. Sometimes a plot of land would be bought and houses built on it - the developer simply naming roads after their own place of origin. 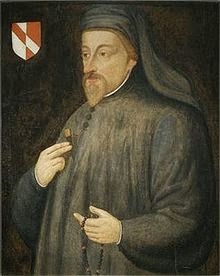 Chaucer - Geoffrey, "the father of English poetry" and author who held various post under the king (1340?-1400). Coleridge, Samuel Taylor, poet, philosopher and critic (1772-1834). Dunbar, William, Scottish poet "unrivalled in Scotland" and Franciscan Friar (c1460-c1520). Gower, probably John, poet and contemporary of Chaucer (c1325-1408). Horace, Quintus Horatius Flaccus. Roman poet and author of satires and letters (65-8 BC). Skelton, John, English poet of Diss, Norfolk (c1460-1529). Cromwell, Oliver, Parliamentarian general and Lord Protector of England during the Commonwealth (1599-1658). Disraeli, Benjamin, earl of Beaconsfield; Conservative politician and witty novelist. Entered Parliament 1837; was twice Prime Minister. (1804-1881). Palmerston, Henry John Temple, Viscount; statesman who held various government offices; became Prime Minister in 1855. Prosecuted the Crimean War; died in office (1784-1865). Shaftesbury - Anthony Ashley Cooper, 7th Earl of, statesman and philanthropist. He held various government offices and brought about much legislation to improve the working conditions of children, the poor, in the mines and factories and those with mental health problems, and for better education and housing conditions (1801 - 1885). Wellington - Arthur Wellesley, 1st Duke of; statesman and successful general who led the army which defeated Napoleon's Army in 1815. See also Waterloo. (1769-1852). Cranmer, Thomas, Archbishop of Canterbury, Protestant martyr (1489-1556). Knox, John, Scottish ecclesiastic and church reformer and founder of the Presbyterian Church of Scotland (1513-72). Latimer, Hugh, Bishop of Worcester, Protestant martyr (1487-1555). Ridley, Nicholas, Bishop of London Protestant martyr (1500-1555). Beauchamp, probably after William and Elizabeth and their son Joseph who owned the Manor of Bretts in Plaistow c1719 and held until 1814, when it was sold to the Pelly family. Eventually the estate was broken up and developed for housing in north Plaistow and "Upton Manor" in 1850s. Boleyn, Anne, second wife of Henry VIII, beheaded on a charge of conspiracy and adultery (1507-1536) - may have had local land connections, but, despite local myths not proven. Brooking, Sir Trevor. Played for West Ham United and made 47 appearances for England. (1948 - to date). 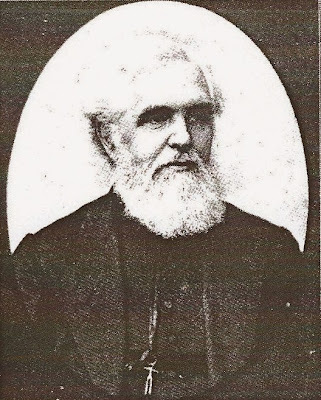 Curwen (a) John (1816-80) Congregational minister, musicologist and publisher (see here); (b) John Spencer, son of the foregoing (1847-1916) founder of the East London Music Festival. Katherine - Fry, daughter of Elizabeth. Her house was at Plashet; she wrote posthumously published history of East and West Ham (1801 - 1886). Moore, Robert Frederick Chelsea "Bobby", OBE; footballer, captain of West Ham United and England (1941-93). Salisbury - Margaret Pole, Countess of Salisbury held the Manor of Bretts, Plaistow, from 1512 to 39. She was beheaded by Henry VIII in 1541. Also Cathedral city in Wiltshire. Tylney - Richard Child, Earl Tylney, built Wanstead House and Park. (1680-1750). Halley, Edmund, mathematician and astronomer-royal (1656-1742). Godwin - either Earl of the West Saxons and powerful nobleman (d.1053) or Francis Godwin, English ecclesiastic, historian and author (1562-1673). Grosvenor - family name of the Dukes of Westminster, an ancient and powerful family. Hold large estates in London and elsewhere. Rutland - (a) the smallest of the former English counties, now part of Leicestershire; (b) an earldom and, later, a dukedom. Vansittart, Nicholas, 1st Baron Bexley, lawyer politician and Chancellor of the Exchequer (1766-1851). Wolseley - Garnet Joseph, 1st Viscount. Field Marshal distinguished in several theatres of war and severely wounded in the Crimean war (1833-1913). Balmoral - castle, Scottish home of the royal family. Claremont - 18th century Palladian mansion and landscape garden in Esher bought by Queen Victoria for her youngest son, Leopold, Duke of Albany, on his marriage to Princess Helena, in 1882. So, although house is little known as a royal residence today, it would, fleetingly, have been so, when this local road was first built. Earlham - Hall, near Norwich, seat of the Gurney family - who owned much of the land in Forest Gate before its late nineteenth century urban development. The Norfolk hall is now part of the University of East Anglia. Hampton - Court Palace, Surrey, country home of Cardinal Thomas Wolsey and later, of Henry VIII. Osborne - House, Isle of Wight. Designed by Prince Albert as a seaside home and much loved by Queen Victoria. Richmond - Palace, Surrey. Original palace was built by Henry VII to replace the Palace of Sheen; became home of many kings and queens; after the execution of Charles I it was sold off and demolished for building materials. Sandringham - House, Norfolk. 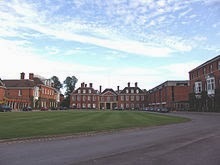 The Norfolk retreat of the queen. It is her private estate and has been the private home of four generations of British monarchs, since 1862. Windsor - Castle, Slough Berkshire. Built by William the Conqueror. Now the oldest inhabited castle in the world and the queen's weekend residence. (This is probably the least informative section of this post! 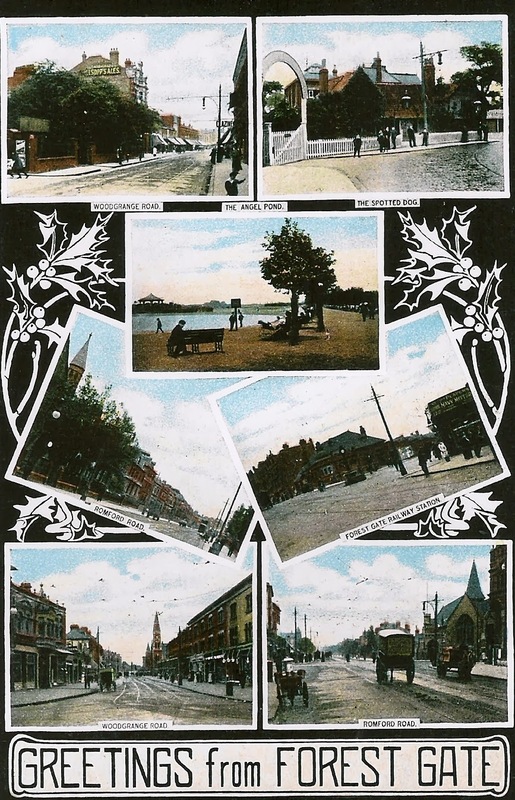 Although it attempts to identify the origins of some street names, in many cases it begs the question of how such a small location, with no apparent connections with Forest Gate could have bequeathed this area its name. All suggestions gratefully received!). Atherton - town in Lancashire with collieries, iron works and cotton mills. Barwick - there are several places in England with this name. Bath - Somerset, university and spa town. Bath Abbey is the seat of the Bishop of Bath and Wells. Bristol - city and port, in the south west. Chester - county town of Cheshire. Clifton - probably, near Bristol, famous for the suspension bridge across the Avon. Clova - possibly Glen Clova in the South Grampians and occupies the valley of the River South Esk in Angus. Colston - neighbourhood of Bristol. Derby - county town of Derbyshire. Dorset- county in south of England. (Previously called York Road). Essex - county in south-east England, of which East and West Ham were once a part. Idmiston - a parish containing three villages near Salisbury (see also), Wiltshire. Ingrestre - possibly a parish in Staffordshire, on the river Trent. Lansdown - Gloucester /Somerset, site of a Civil War battle. Marlborough - town in Wiltshire. Norfolk - county in south east England, ancestral home of Gurneys, see above. Norwich - cathedral city and county town of Norfolk. The Gurney family had their seat at Earlham, near here. Prestbury - possibly after one of two villages; one in Cheshire, the other in Gloucestershire. Rothsay - probably from Ayrshire, Scotland. 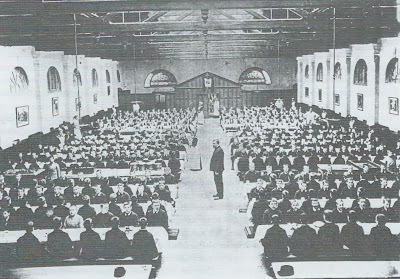 St. Georges - possibly after a school for pauper children built in 1851 by St. George's-in-the-East Poor Law Union (Stepney), which stood at the junction of Green Street and Shaftsbury Road; closed about 1927. Shrewsbury - county town of Shropshire. South Esk - a river in Scotland, see also Clova. Sprowston - a large suburb of Norwich (see above) See also Earlham. Stafford - county town of Staffordshire. Studley - Warwickshire. The original Manor of Studley was in the possession of William Beauchamp (see above), Lord Abergavenny. In about 1830 a castle was built here in the Norman style by Sir Francis Lyttleton Goodricke, it is now a hotel. Suffolk - county in East Anglia. Tower Hamlets - a small group of hamlets on the east side of the city that came under the jurisdiction of the Lieutenant of the Tower of London - principally Stepney, Poplar, Whitechapel and Mile End; which itself gave the name to Newham's neighbouring borough. Westbury - town in Wiltshire on the edge of Salisbury Plain with an iron works and important railway junction. Famous for the nearby White Horse hill-carving. Woodstock - town in Oxfordshire, famous for Blenheim Palace. 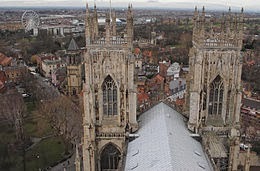 York - either the county town and cathedral city of Yorkshire or after Dukes of York, a title often borne by the sovereign's second son. Bective - possibly a Cistercian Abbey in County Meath, Ireland, suppressed by Henry VIII in 1536. Ismalia - town in Egypt that was headquarters for the Suez canal construction project, in the 1860's - a little before the time of the development of much of this area of Forest Gate. Odessa - in the Ukraine, a city and seaport on the Black Sea. It was bombarded by British and French naval forces in the Crimean War. Waterloo - a small village in Belgium where Wellington's forces (see above) defeated Napoleon's Army in 1815. Field (Road): a lane leading into a field or into open ground. Forest (Lane, Street): leading to and from the forest of Epping. Whitehall (Place): part of the site formerly occupied by a school of this name - replaced by Forest Gate School. Woodgrange (Road): a grange was a barn used for storing grain (often the grain tithes owed to a monastery); a farmhouse with barns and other out-buildings; an outlying farm in a forest clearing. The Farm was probably part of the endowment of Stratford Langthorne Abbey. 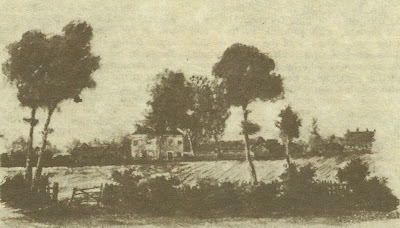 The Manor of Woodgrange - also called "Ham Frith" - stretched from the lower forest, (now Wanstead Flats) past the Eagle and Child pub, down to the Romford Road, and almost as far as High Street North (then called White Post Lane). A New Encyclopedia of General Knowledge, Odhams Press, c1938, Collins Concise Encyclopedia, 1977, East Ham from Village to County Borough, Alfred Stokes, 3rd ed., 1933, Fifty Years a Borough - The Story of West Ham, Donald McDougall, publ., by the County Borough of West Ham, 1936, Foxe's Book of Martyrs, W. Grinton Berry, Baker Book House, 1987, Geographers' London Atlas, ed., Victoria Histories of the Counties of England (Vol., 6 - Essex), West Ham: Eight Hundred Years, Frank Sainsbury, publ., by the County Borough of West Ham, 1965, West Ham 1886-1986, publ., by the London Borough of Newham, 1986, Wikipedia. 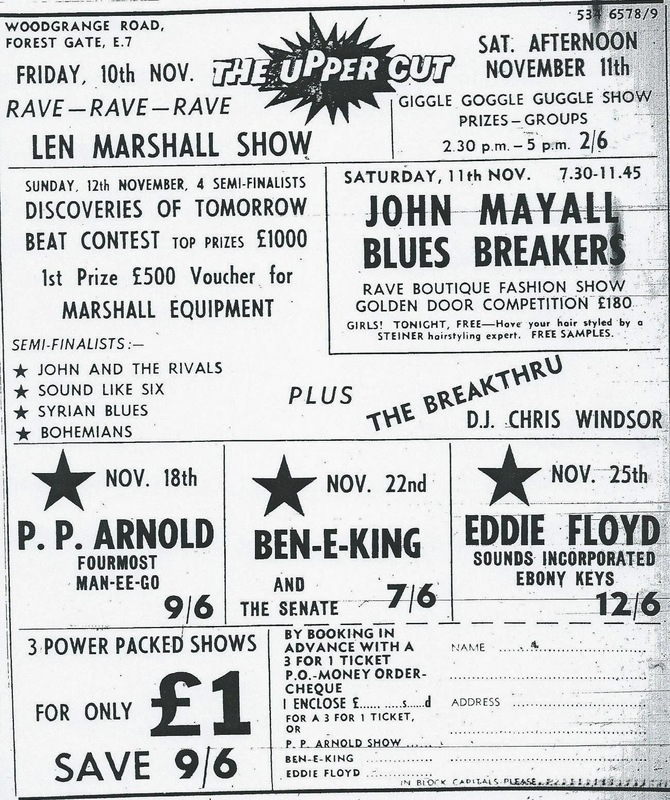 In the third of our monthly glance backs at the golden age of the Upper Cut club, we feature what was on offer, locally, 46 years ago - in November 1967. For links and details of the others, see footnote. Although the Club's regulars may not have known it, this was probably its last, great, month. 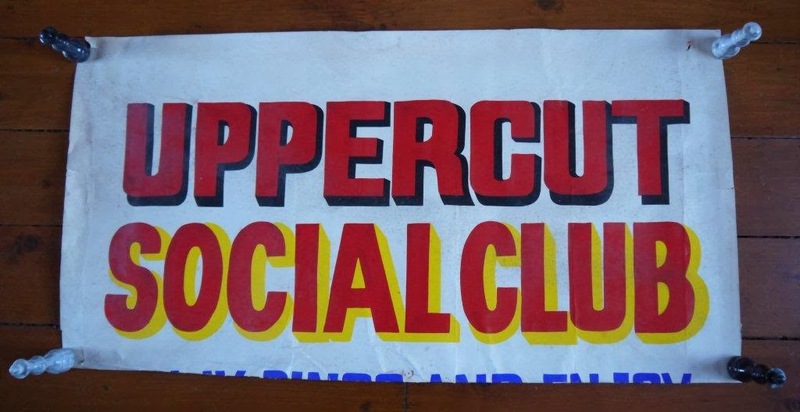 We'll examine reasons for the Upper Cut's demise in our next look back. But one factor, without question, was the emergence on the scene of serious local competition. 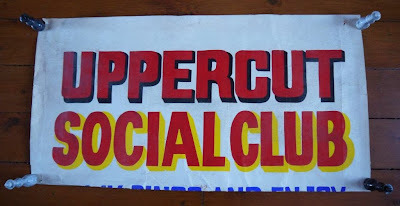 The Upper Cut had had pretty much a free run at providing high quality gigs locally, in the 10 months since it had opened. Other potential promoters began to wake up, however, to the money making possibilities that good quality live popular music offered in East London. So, although the Upper Cut continued to offer tasty gigs for local youth, serious rival attractions were promoted for the hard earned East End pocket money. In November 1967 alone, the Lotus Club, just across the road from the Upper Cut - above what is now the 99p stores - featured the Moody Blues, for 7/6d (about £6, today) and the Foundations for 6/6d (a little over £5) - a cheaper price than any "name" band the Upper Cut featured at the time. These were no mean acts. The Moody Blues had formed in 1964 and by the time of their Forest Gate appearance had already been on Ready Steady Go a number of times and issued their smash number 1 hit: Go Now. Denny Laine had by now left the band and the inspirational Justin Hayward had joined. At the time of their Lotus Club gig they were about to release the ground breaking concept album Days of Future Passed, a rock version of Dvorak's New World Symphony - much of which doubtless got an early airing on Woodgrange Road. The Foundations appeared at the Lotus club three days later! They were a much more basic British soul band, whose prime was 1967 - 1970. By the time the starred in Forest Gate they had already had their first number 1 hit, Baby Now That I've Found You and were about to release their second, co-written by Manfred Mann's Mike D'Abo, Build Me Up Buttercup. 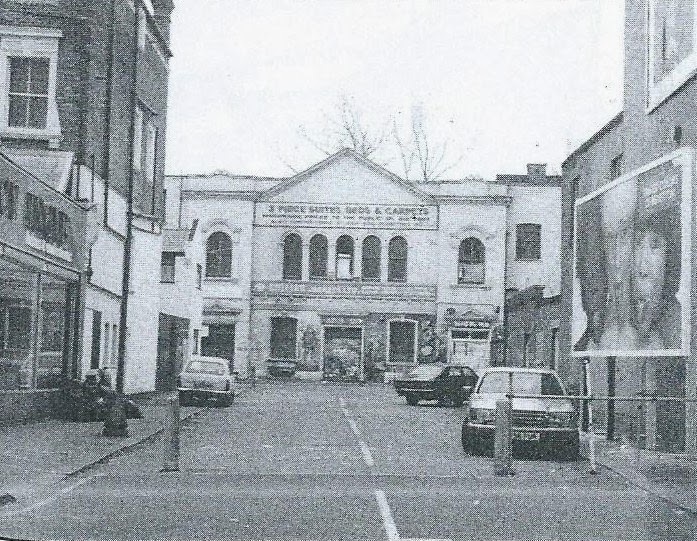 Meanwhile, down the road, at Leyton Baths, even more competition was promoted for the Upper Cut, with the appearance of The Troggs on Saturday 18th and Georgie Fame, a week later. Fame had already appeared at the Upper Cut two months previously (see footnotes) and so could have expected some of his fans to have drifted from Woodgrange Road on the 25th to see him in Leyton. This would have been bad news for the door takings of the Eddie Floyd gig, held in Woodgrange Road the same night. The Troggs themselves were no slouches, lead by the eccentric, and now recently deceased, Reg Presley. They were big box office at the time of their Leyton gig, having over the previous twelve months had huge hits with: Wild Thing, With a Girl Like You, I Can't Control Myself and Any Way You Want Me. They were on the point of releasing Love is All Around, which was later to become a better known hit for Wet, Wet, Wet, as part of the sound track for the film Four Weddings and a Funeral. Meanwhile, at the same time, the Upper Cut was presenting PP Arnold - good as she was, she would have struggled to match the appeal of the British chart toppers. So much for November's rivals - what of the Upper Cut, itself? Sunday 5 November, the day after the Moody Blues were at the Lotus, saw Simon Dupree appear at the Upper Cut. It must have appeared poor competition to local youth, for the weekend's entertainment . They were very much a band in transition at this time. Having been fairly unsuccessful recording covers of US soul singles, they gradually moved to become a psychedelic rock band, and the Forest Gate gig caught them on the cusp of this change. They appeared in Woodgrange Road just as their first hit in this new genre: Kites, began to take off. It was about this time an unknown pianist, Reg Dwight, joined their line -up, for £25 per week, for a short stint. The band politely declined his request to record some of his self penned songs with them. It is not clear, however, whether the person later to emerge as Elton John tickled the ivories during their Woodgrange Road gig. 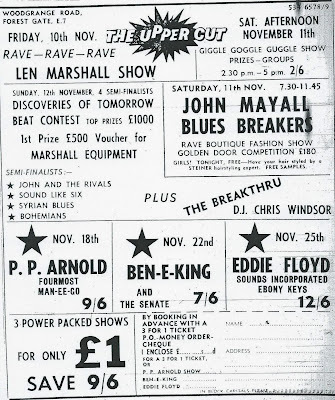 Within a week, John Mayall and the Blues Breakers, one of Britain's most influential blues bands, were appearing at the Upper Cut. The band was originally formed in 1963, and over its chequered past has included over 100 members. That number included Eric Clapton and Jack Bruce - who left to form Cream, and Peter Green, Mick Fleetwood and John McVie, whose departure signalled the formation of Fleetwood Mac, just before their Forest Gate gig. Meanwhile, Mayall had recruited Mick Taylor - later of the Rolling Stones - to the line up, who would have featured at the local gig. John Mayall's groups were never as successful as record makers as they were as star spotters, and probably their biggest single hit, Parchment Farm had been issued just before their foray into Woodgrange Road. A week later saw the PP Arnold gig at the Upper Cut, where she was playing "against" The Troggs at Leyton Baths (see above). The American soul singer Arnold had started her musical career backing Ike and Tina Turner, and came to England in 1966, to support the Stones. By the time of her Upper Cut appearance, she was in a relationship with local Small Faces maestro Steve Marriott, and had recently recorded what was probably her biggest UK hit - which surely would have got a Woodgrange Road airing -the Cat Stevens penned The First Cut is the Deepest. In her prime, Arnold toured with Jimi Hendrix, The Who, The Kinks, Blind Faith, David Bowie and Delaney and Bonnie - most of whom also, of course, appeared in Forest Gate in this era. Still active in the entertainment business, PP Arnold continues to record and appear on stage in musicals. Five days after the her performance, Ben E King was back appearing at the Upper Cut - almost a month to the day after his previous appearance. See here, for details. 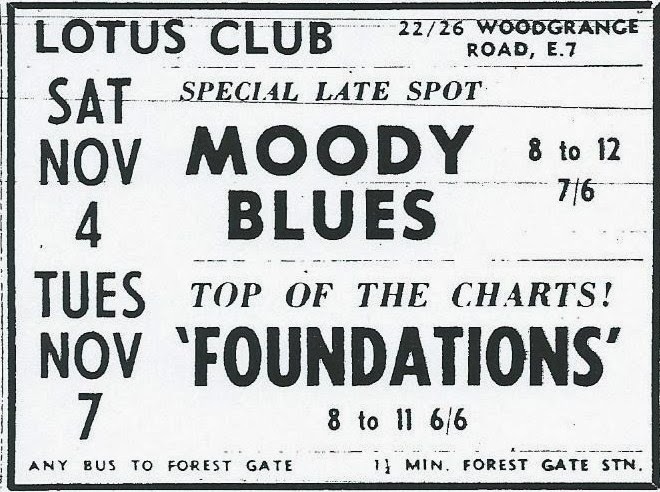 Three days later Eddie Floyd was headlining in Woodgrange Road, for 7/6d admission charge (about £6, today), in "opposition" to Georgie Fame, who was playing Leyton Baths. Although Floyd was never huge in the UK, he had recently recorded his biggest UK hit Knock on Wood, which had chart topped in the US, earlier in the year. Floyd was born in Montgomery Alabama and was signed by the Memphis-based Stax label. His most successful recording period was over, but he prospered for a while afterwards as a songwriter. He is still on the road today, often making guest appearances on the bill with other 60s and 70s soul greats.